Fixes for Dart 2 type system. Stop using deprecated HTTP constants. Improve handling of pre-release packages. Fix for latest Flutter SDK. Fixed code organization to eliminate warning during pub global activate. Improvements in CLI error handling and help. 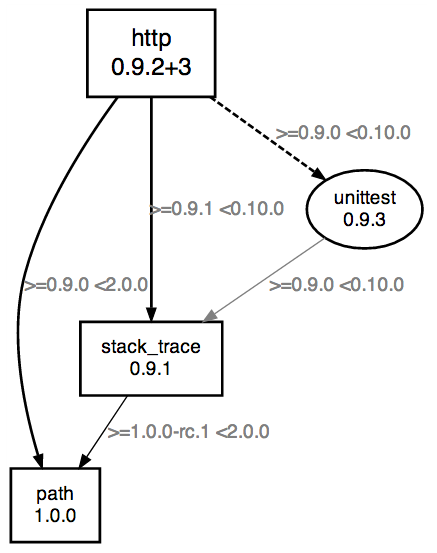 Using nodesep=0.2 on the graph to make it tighter. Much more robust handling of node clicks to add/remove. Make it clear that nodes can be clicked by changing the cursor. Better error output if a subprocess fails. Try to handle flutter packages. Better hover-over behavior for outdated dependencies. Use viz-lite.js – smaller download. Continue to host vis.js so we don't break existing installations. Use gviz package. Get out of the GraphViz formatting business. Fix case where we're pulling in a pre-release version that is after the latest stable version. Send a descriptive user agent to the server. Added retry logic for HTTP requests. Better stack trace on errors. Cleanup, handled some deprecations, improve load time. Tweaks test code, examples, dependencies. Properly escape the latest version for outdated dependencies. Add a reasonable tool-tip for the entire graph. Don't show the root node as outdated. Using CSS animations for effects. Hosting style on GitHub. All fancy with mouse-over effects. With --flag-outdated (-o) do version lookup in parallel. MUCH faster. Allow ignoring packages via --ignore-packages. Thanks, Günter! A fix for running on Windows. Thanks, Oliver! A fix for formatting packages with hyphens. Thanks, Bryon! Primary library: package:pubviz/pubviz.dart with components: io. Common filename patterns include main.dart, example.dart, and pubviz.dart. Packages with multiple examples should provide example/README.md. A tool to visualize package dependencies and version constraints in your Dart project.